So far Ben Roberts has created 249 blog entries. We were delighted to welcome staff from St James to one of our regular PTA Coffee Mornings. They brought a model of the Westbury Estate masterplan and answered questions relating to their two developments which have begun on the Wandsworth Road. Our Year 5s have been sharing their outdoor learning skills with our Nursery children. Back in the summer they collected and potted up lots of strawberry runners (baby plants) from last year’s strawberry plants [see final photo below]. 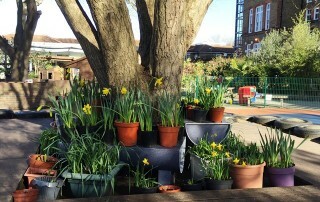 As part of their outdoor learning Year 5s have been learning about planting and displaying spring bulbs. 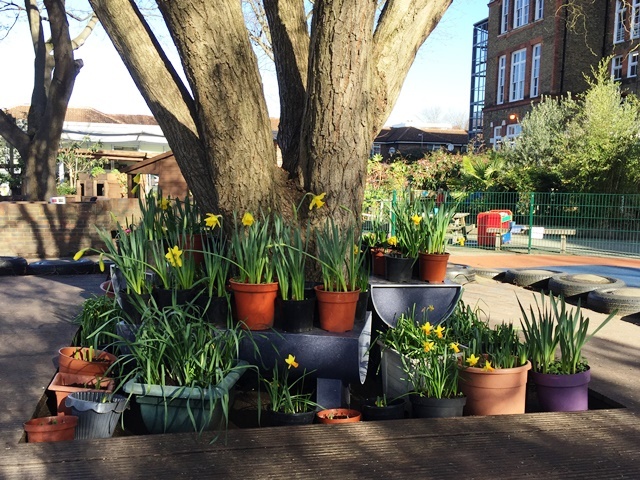 This week they created this stunning arrangement around tyre island in our playground for everyone to enjoy at drop off, pick up and through the day too! Our focus for Be the Best you can Be! this half term is Resilience. What better way to demonstrate this than with the help of two of our violinists showing off their perseverance at one of their weekly instrumental sessions? !